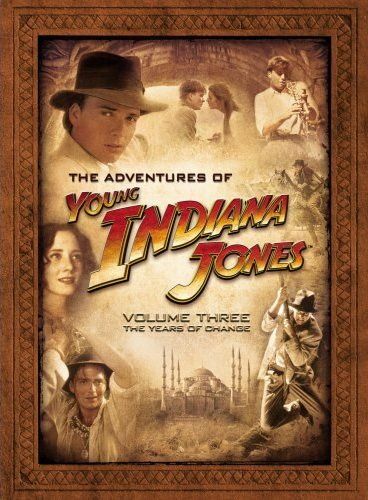 The Adventures of Young Indiana Jones - Volume Three is the last of the Young Indiana Jones series. In it, you will cease to find any of the little boy Indy, and like the other two box sets you will also not see any of old man Indy, but in one episode you will get to see a cameo by Harrison Ford as he reprises his role for a short bumper segment. That was cool to see, but the actual story and action behind the cameo scenes were far from special... much like most of this box set. Even though the episodes are two hours long, most are really just two separate one-hour episodes that are pasted together. When I first started in on this new set, I was extremely disappointed. The first episode was all about Indy trying to court a girl who was also being courted by some other mystery guy. There was barely any action, no adventure, and a general feeling of why do we need to see this? Why is he spending all this money on a girl who is allowing some other guy to do the same? Is she really the only pretty girl within a hundred miles? Does he really want to be with a girl who can be bought with gifts? And why do I get the feeling that his good friend whom he just met is going to turn out to be the other guy? After that first hour, I just didn't want to see anymore. The second hour finds Indy moved to North Africa where he is assigned to be an undercover agent in the French Foreign Legion. This was WAY better that what we had just watched, but it still wasn't anything spectacular. Indy must solve the mystery of who is supplying weapons to the rebels, and befriends an apparently famous novelist named Edith Wharton. They spy work here is mildly interesting, while the romance between Indy and Edith just feels weird. Next, Indy is undercover as a journalist in Instanbul (yep, he gets around all right!) where he is trying to secretly help make some kind of deal happen where one country can get out of the war and have their independence (or something like that), but there is a traitor around causing everything to go wrong. I was a bit confused during this one, and again there was no adventure. There was a bit of action, and once again some dull romance, but that was about it. The second half of this episode is the stupidest of the entire series. Indy is now sent to Transylvania where he and his little group encounter supernatural events and meet Dracula. I know that the whole Indiana Jones thing isn't supposed to be uber-realistic or anything, but this episode just takes it to the level of complete absurdity. Both my wife and I found it to be completely ridiculous and neither of us wanted to continue viewing anymore episodes after we had seen this one. Thankfully, we did continue on, because the next episode was the best of the bunch. Titled Treasure of the Peacock's Eye , Indiana Jones finally gets to go on an adventure in search of an item. Reunited with his friend Remy at the end of the war, they go off in search of a diamond following clues from a treasure map they obtained off a German soldier only minutes before the fighting ended. The adventure was fun and energetic, it had action and it had rival treasure hunters, and it had pirates and islands with fierce-looking natives. If only more episodes could have been like this one. I won't go through every episode, but I'll say that none are as good as the previous episode, and none are as bad as the Dracula episode. Some focus more on comedy, others on drama, and an occasional mystery here and there, but no adventure, and no real action to speak of. Romance rears its ugly head again and again, which just never works well. He's a young man, he likes girls, I get it but I just don't care. The settings are nice, witnessing the attitudes, the arts, and the science of the times. I think the blues episode really shows this off the best of any episode, even though I found the actually story there to be rather dull. The action picks up a bit in the second part of that episode, though, as Indy and his pals attempt to solve a murder. The series is only a part of this collection, however, as there are a ton of documentary specials which touch on the historical characters that Indy meets in his travels. These can be interesting, if you're in the mood to watch them. You can't settle in looking for an adventure, but if you want to learn about history then these do a pretty good job.